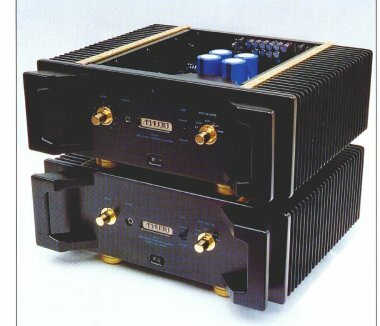 Attilio Conti's aim, who is the AM AUDIO owner, is to build Hi-Fi very high quality and performance. Nothing has been disregarded: electronic, mechanical components and layout, everything shows the quality of the project. In this way, he who buys an AM AUDIO component is sure to find a no compromise object which comes with a five years warranty. Attilio Conti does not have distributors in Italy, but he sells directly to the customers. Their ads claim AM Audio makes "Components for audiophiles", and we are going to verify if what they say is true. Even though it has an elegant appearance, being full black with two golden knobs and the trademark plate in evidence, it can't hide its size. It reminds me Schwartznegger wearing an elegant party dress. It has four handles which are very useful considering its heavy weight, 26 Kg (that's 55 lbs, dudes! ), and without them it is almost impossible to MOVE the amplifier. Anyway its appearance evidently shows its quality level. What a beautiful inside view! Mr. Conti made a mistake hiding this marvelous layout. I think it is even prettier than the outside view. If I could own one the first thing I would do is replacing the top cover with a transparent plexiglass one. The passive preamplifier section has just an input switch (Elma), an anti-RFI filter and Noble/Alps volume control. 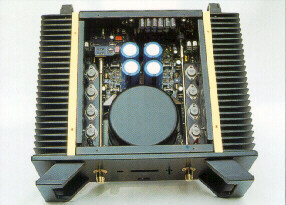 The power supply uses four big 63V caps for 60,000 µF of total capacitance. The output section uses two pairs of mosFETs per channel, placed directly against the huge heat sinks (see picture for details). The location of the IEC socket for the main power is pretty unusual: it is on the lower part of the amplifier, directly under the massive 500 VA (!!!) toroidal transformer, so to avoid to run the mains cables "inside" the cabinet. Neat. The data claim a 2x100W @8ohm and a 2x220W @2ohm output power with a 50 A (!!!) current peak. 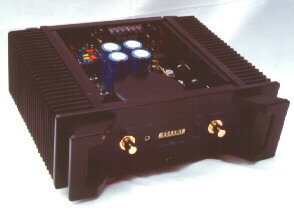 Another peculiarity of this amplifier is that it works in class A up to 2x5 Watts @8ohm. On the rear we can find 5 line inputs, the tape connections, the gold plated loudspeaker output posts and a socket which is meant for an external AM Audio phono stage. On the front panel there are the main on/off switch, the input switch, the tape Monitor switch, the headphone socket (which signal is taken directly from the amplifier output without using any switch) and a little green led indicating the working status. There's nothing complicated in this amplifier. On request you can have the remote control for the volume. The main IEC socket, because of its unusual location, is pretty unpractical to use After the listening test, I understood why this unusual solution has to be preferred. CD Player Marantz CD 17 with tip toes and ART Q-DAMPERS. I also put a TNT-Press on top of the chassis. CD Damper MONSTER DISCUS. Loudspeakers: SPENDOR SP2/2 with upgraded cabinet and cross-over. Stiff and light metallic stands with spikes. Interconnects and power cables: ESOTERIC AUDIO, mains cable TNT-TTS. Warm up before listening: 20 minutes. I'd say: when looks doesn't say it all! Being so heavy and massive I expected a certain kind of sound...BUT! The PA-100 has a very musical sound and listening to it is a very relaxing and pleasant experience. It sounds gentle and relaxed though no roll-off on the highs is audible. No artificial sweetness, here. The Music flows through it very naturally and coherently and the harshness of certain "fatigued" amps is totally absent. The energy related to the frequency appears to be constant, with a bass range that's well extended, powerful and articulated, aided by a clean and neat mid-bass. With respect to the dynamic performance it sounds naturally energic without being explosive or intimidating. The sense of pace is good and it contributes to that "natural" feeling described above. Since now, I've been listening to the PA-100 with the volume control at nine o'clock. OK, this means nothing, after all, but I want to test how this amp reacts at very high listening levels. After all, it is a monster which weighs 55 lbs!!! This is one of the "atouts" of this amp: it can sound gentle and refined either at low and very high listening levels. Do you have hard-to-drive low-efficieny loudspeakers? Hook up a PA-100...and smile! During the listening test some peculiar characteristic showed up. The amplifier does not work properly with anti-RFI mains filters. I tried to use one and the only thing I got was an audible reduction of overall dynamics. With respect to the power supply, I noticed that the PA-100 seems to not care a lot of the electric phase and of the different mains cables used. Using our cable TNT-TTS, the sound did not changed so much as it happened testing other amplifiers. I think the reason is that AM-AUDIO designers took properly in account these problems. They carefully designed the power supply section and decided to protect the power transformer with an armoured shielding cover. They placed the IEC socket close to the transformer (an unpractical but good sounding solution). They also used a passive line stage. Many times I've noticed that the active line stage takes advantage of using a high quality mains cable more than the passive line stage. Considering how the PA-100 sounds I suggest you to use very analytic loudspeakers. This kind of loudspeakers coupled with low quality amplifiers normally sound pretty bad. I'm not telling you that the PA-100 does not sound good with cheap partners. I just think that it is clever to use high quality stuff. Complaints? I'm sorry to disappoint who was waiting for this section but I don't know what I should criticize. If you don't like such a slim :-) appearance the PA-100 is not for you. If you are not going to couple it with adequate partners as source, cables and loudspeakers, it is better for you to choose a cheaper amp. I think you may obtain the same results while saving your money. Re-reading this review I think you might think I have been too enthusiast. I want you to know that even if I tried to be as impartial as I could I had to show you the undeniable very high quality of the AM Audio PA-100. It works as good with bookshelf loudspeakers as with very big ones, showing its dynamic ability yet sounding warm and smooth with every kind of Music. Ask for anything, the PA-100 will give it to you! For this reason I call it the Aladdin's lamp! I would like to sincerely thank Attilio Conti, AM-AUDIO owner, for having sent us this amp for this listening test.